Horrible/Adorable ~ Christmas A Go Go! Sweet-as-cherrywine voices over LOUD FUZZY GUITARS. A winning combination, if you ask us. 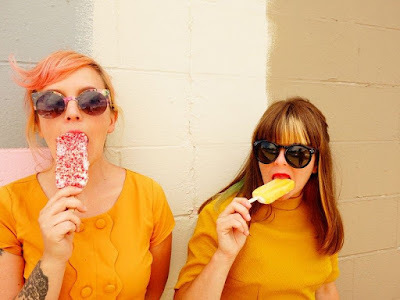 Horrible/Adorable, made up of guitarist Kristin “Kiki” Petiford and drummer Candice Kuter from Oakland, just released a single with a we've got a fuzzbox and we're gonna use it-attitude to Christmas, covering Merry Christmas Baby and adding their own (?) 'Santa, Dear', which we love best.